Clinical research looks for answers to specific medical questions. Some clinical research simply involves collecting information about patients or having them take a survey. 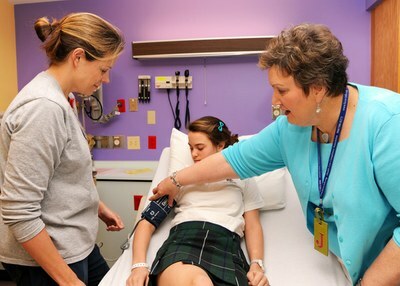 Other clinical research involves testing new medicines or vaccines. These studies are called “clinical trials.” They are carefully supervised and designed to test the new treatments in the safest way possible. Participation in any research study is strictly voluntary. Why Should Families Consider Participating? Our understanding of health and our ability to treat and prevent diseases would never move forward if families didn’t participate in clinical research. Doctors would have no way of knowing if a new medication is better than an old one, or if a new vaccine could protect children from an infection. They would not be able to predict the course of a disease or understand parents’ attitudes regarding the care of their children. Our ability to make health care better depends on careful research—and on children and families who volunteer to participate. One possible benefit to participating in research is that the child may be one of the first patients to have medications and vaccines that are not yet available to the general public. But the main thing is that supporting clinical research is one way families can help all children. Are There Downsides to Participating in Clinical Research? Sometimes clinical research involves getting extra information that is not normally collected for routine care. For example, a clinical trial may require an extra blood test. There is also the possibility that a new medicine will not be effective, or that it will have an unexpected side effect. This is why the studies need to be done—to see if the new medicines are better and to prove that they are safe. However, before any study is done, researchers are especially careful to have a good reason to believe that the new medicine will be safe and effective. Every study is strictly regulated and closely supervised by teams of doctors, scientists, and lay people as well. Participating in a study may mean extra time and inconvenience. Because of this, some studies may pay families who participate.